Welcome to the webpage of Prof. Michael Chapman's research group at the School of Physics at the Georgia Institute of Technology (Georgia Tech) in Atlanta, Georgia. Our research is focused on investigating the quantum behavior of atoms and photons, often at the single particle level. We employ lasers to confine and cool atoms to nano-Kelvin temperatures, which are used for studies including fundamental atom-photon interactions, atom optics and interferometry, and quantum computing and communication. Our group recently tested the Kibble-Zurek mechanism in a spin-1 Bose-Einstein condensate, and the parametric excitation and stabilization of a many-body system. We previously studied the dynamics of a quantum inverted pendulum, spin-nematic squeezing, and coherent spin mixing. Earlier achievements include the first all-optical Bose-Einstein condensation, the first storage ring for neutral atoms, and cavity QED with optically transported ultracold atoms. We utilize an all-optical trap to cool 87Rb atoms down to quantum degeneracy and study various phenomena only present in cold atom systems. We focus on spinor Bose-Einstein conde nsates (BEC), where collisions between atoms act on the spin degrees of freedom of the system, infuenced by external parameters such as magnetic fields. The primary objective of this research is to develop non-destructive, or lossless, quantum state detection methods for single trapped neutral atoms in order to realize robust neutral atom qubits. 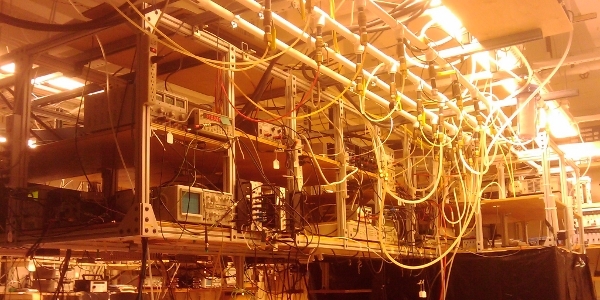 We propose to apply AMO technologies of ion trapping and cooling and high resolution spectroscopy to the manipulation of a nuclear excited state. We demonstrate dynamic stabilization of a strongly interacting quantum spin system realized in a spin-1 atomic Bose-Einstein condensate. The spinor Bose-Einstein condensate is initialized to an unstable fixed point of the spin-nematic phase space, where subsequent free evolution gives rise to squeezing and quantum spin mixing. To stabilize the system, periodic microwave pulses are applied that rotate the spin-nematic many-body fluctuations and limit their growth. The stability diagram for the range of pulse periods and phase shifts that stabilize the dynamics is measured and compares well with a stability analysis. • 12/2018: Congratulations to Lin Xin for winning the APS Distinguished Student Award for outstanding reseach! • 08/2018: Congratulations to Dr. Bharath Hebbe Madhusudhana for successfully defending his Physics Ph.D. thesis. • 07/2018: Congratulations to Dr. Bharath Hebbe Madhusudhana for successfully defending his Math Master thesis. • 05/2018: "Staircase in magnetization and entanglement entropy of spin squeezed condensates" available on arXiv. • 05/2018: "Singular Loops and their Non-Abelian Geometric Phases in Spin-1 Ultracold Atoms" available on arXiv. • 11/2016: Geometric phases: "Three minute thesis competition" video. 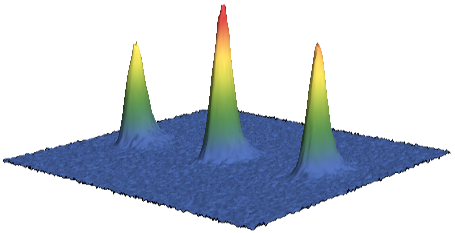 • 4/2016: "Kibble-Zurek Mechanism in a Spin-1 Bose-Einstein Condensate" published in PRL. • 12/2015: "Characterizing the energy gap and demonstrating an adiabatic quench in an interacting spin system" available on arXiv. • 12/2015: "Parametric Excitation and Squeezing in a Many-Body Spin System" available on arXiv. • 9/2015: Congratulations to Dr. Martin Anquez for successfully defending his thesis. • 9/2015: Matt goes to the BEC conference in Sant Feliu, Spain. • 6/2015: Bharath goes to DAMOP in Columbus, OH. • 10/2013: Congratulations to Dr. Thai Hoang for successfully defending his thesis. • 8/2013: Thai Hoang's paper published in PRL: "Dynamic Stabilization of a Quantum Many-Body Spin System"
• 8/2013: Mike DePalatis's paper published in PRA: "Production of translationally cold barium monohalide ions"
• 8/2013: Congratulations to Dr. Michael DePalatis for successfully defending his thesis. • 6/2013: Chung-Yu's paper published in PRA: "Nondestructive light-shift measurements of single atoms in optical dipole traps"
• 3/2013: Congratulations to Benjamin Land for an award H. Fukuyo Outstanding Physics Undergraduate Awards. • 3/2013: Congratulations to LTC Corey S. Gerving, PhD for successfully defending his thesis. • 2/2013: Congratulations to Dr. Chung-Yu Shih for successfully defending his thesis. • 1/2012: Congratulations to Dr. Chris Hamley 2012 an Amelio Award for Excellence in Research in the School of Physics. • 10/2011: Congratulations to Dr. Chris Hamley for successfully defending his thesis. • 12/2010: Congratulations to Dr. Michael Gibbons for successfully defending his thesis. • 11/2010: Congratulations to Dr. Eva M. Bookjans for successfully defending his thesis. • 07/2010: Congratulations to Dr. Layne Churchill for successfully defending his thesis.